Did you see something this past season that made you want to give someone a prize? 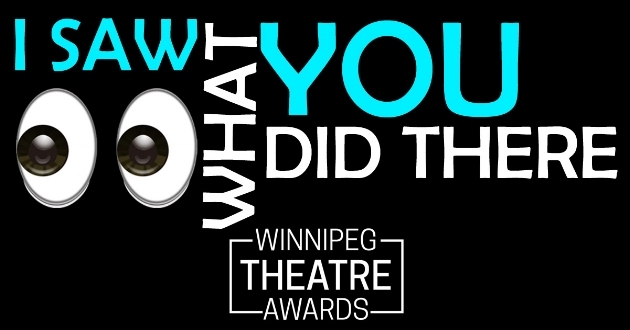 However small and fleeting it may be, we encourage you to send us nominations for the "I Saw What You Did There" awards, to be presented at the 2018 Winnipeg Theatre Awards on November 4! In this category, a nomination is an automatic win. Anyone can make a nomination: professionals, non-professionals, theatre staff, audience members. Send an email to winnipegtheatreawards@gmail.com saying what the award is and who you’re nominating. •	You can request that the prize be presented as “nominated by Anonymous” but you must provide your name to the committee. Why? Because you can’t nominate yourself! You are free to beg your friends to nominate you, however. •	No sarcasm or irony. That means no “Best Performance by An Actor who Wasn’t Half as Good as I Would Have Been if Those Jerks had Only Hired Me.” You know what we mean! See you at the 2018 Winnipeg Theatre Awards! For all the information, click here!